Are you anxious to get going on your getaway? Do you want to treat your canine or feline friend to the ride of their life? 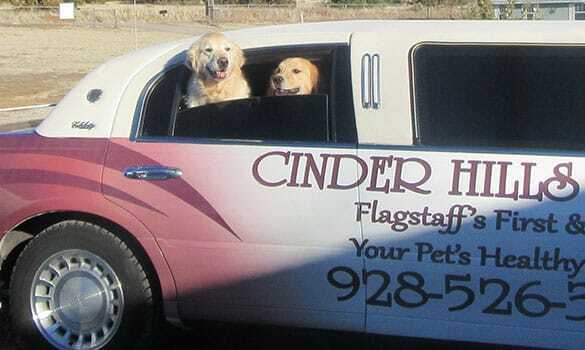 Then maybe you need to reserve a spot for us to come to you in Flagstaff's exclusive pet-only stretch limousine! 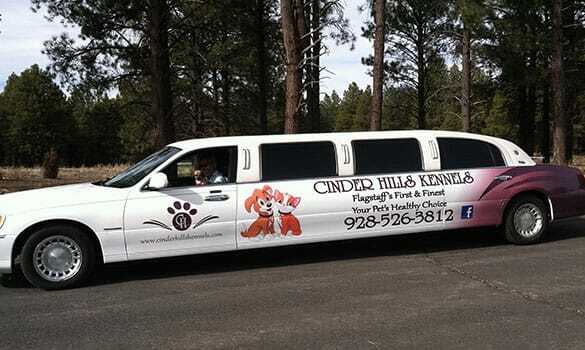 Our stretch limousine comfortably seats 6 (24 paws) and is certain to be the "bark and call" of every pet guest. While riding in luxury, guests can sprawl out on the leather seats; sip the finest, fresh, cold drinking water; or belly up to the Muttini Bar and enjoy yogurt and dog treats that are all complimentary during their ride in style! 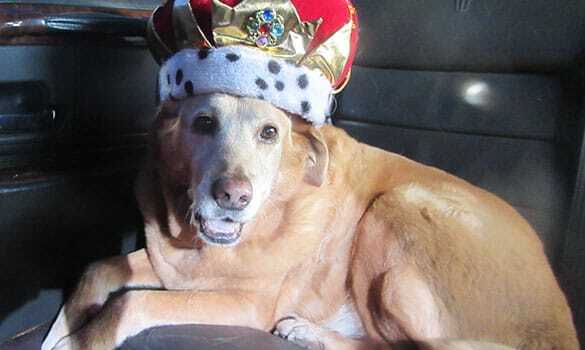 Besides door-to-door service (available in the greater Flagstaff area), while boarding, owners can schedule "joy rides" for their furry friends to investigate the sights and smells of the day or even to stop and order a quick burger from a drive-thru. We provide comfortable and safe pet transportation for an affordable price. You can rest easy knowing that our professional pet chauffeurs are trained and licensed in pet care services, drug tested, have had criminal background checks performed, and have clean driving records. Our drivers and vehicle are licensed and certified through the Arizona State Department of Transportation. * We go the extra mile to ensure that your family members are safe. We have specially-designed dog harnesses for those desiring their pets to be secured during the trip. Cats must be crated. Cinder Hills has made it very affordable for your family members to ride in luxury! $20 Private "Joy Ride" while staying with us. Call for quote outside of the Flagstaff area. Prices are per household. Limousine services are by appointment only. * Per ARS 41-2096, 41-2097 and Arizona House Bill 2135 of July 2015 we have a ZERO TOLERANCE DRUG POLICY for all drivers. If you have reason to believe that any of our drivers are in violation of our zero tolerance drug policy, call our office immediately to find out how to file a formal complaint!